Dr. Parker has indicated no relevant conflicts of interest. Dr. Parker is Professor of Medicine in the Division of Hematology and Bone Marrow Transplant at the University of Utah School of Medicine. Paroxysmal nocturnal hemoglobinuria (PNH) is a consequence of clonal expansion of one or more hematopoietic stem cells with mutant PIGA (located on Xp22.1).1 The protein product of PIGA is a glycosyl transferase that is an obligate constituent of a complex multiprotein pathway required for synthesis of the glycosyl phosphatidylinositol (GPI) moiety that anchors some proteins to the cell surface. As a result of mutant PIGA, progeny of the affected stem cells are deficient in all GPI-anchored proteins (GPI-AP). Although more than 20 functionally diverse GPI-APs are expressed by hematopoietic cells, it is deficiency on RBCs of the two GPI-anchored complement regulatory proteins, CD55 (decay accelerating factor) and CD59 (membrane inhibitor of reactive lysis), that underlies the hemolytic anemia that is the clinical hallmark of PNH. RBCs lacking CD55 and CD59 undergo spontaneous intravascular hemolysis as a consequence of unregulated activation of the alternative pathway of complement. Although PNH is a clonal disease, it is not a malignant disease, and (for reasons that are unclear) the extent to which the PIGA mutant clone expands varies widely among patients. As an example, in some cases, >90 percent of the peripheral blood cells may be derived from the mutant clone, while in others, <10 percent of the circulating cells may be GPI-AP deficient. Another remarkable feature of PNH is phenotypic mosaicism based on PIGA genotype that determines the degree of GPI-AP deficiency.2 PNH III cells are completely deficient in GPI-APs, PNH II cells are partially (~90 percent) deficient, and PNH I cells express GPI-APs at normal density (these cells are progeny of residual normal stem cells). Phenotype varies among patients (see Figure 1). 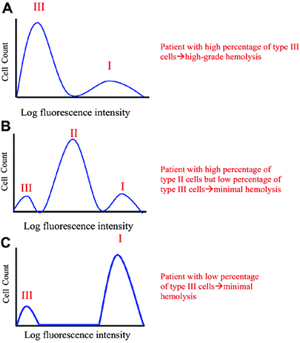 Some patients have only type I and type III cells (the most common phenotype); some have type I, type II, and type III (the second most common phenotype); and some patients have only type I and type II cells (the least common phenotype). Further, the contribution of each phenotype to the composition of the peripheral blood varies (see F.1). Phenotypic mosaicism is clinically relevant because PNH II cells are relatively resistant to spontaneous hemolysis, and patients with a high percentage of type II cells have a relatively benign clinical course (see F.1). † Karyotypic abnormalities are uncommon. § Aplastic anemia and refractory anemia/MDS are the most commonly associated marrow failure syndromes. ¶ Analysis of PMNs is more informative than analysis of RBCs due to selective destruction GPI-AP deficient RBCs. The anemia of PNH is complex for three reasons. First, the size of the PNH clone varies widely among patients (see F.1 & 2). Patients with large PNH clones (see F.2, upper panel) have classic signs and symptoms of PNH (see Table) while patients with small clones (see F.2, lower panel) may have only biochemical evidence of hemolysis with minimal or no clinical manifestations (see Table). Second, PNH phenotype affects the rate of hemolysis, as PNH II RBCs are significantly more resistant to complement-mediated injury than PNH III RBCs (see F.1). Third, an element of bone marrow failure is present in all patients with PNH, although the degree of marrow dysfunction is variable. In some patients, PNH arises in the setting of aplastic anemia. In this case, marrow failure is the dominant cause of anemia. In other patients, evidence of marrow dysfunction may be subtle (e.g., an inappropriately low reticulocyte count) with the degree of anemia being determined primarily by the rate of hemolysis. The primary clinical manifestations of PNH are hemolysis, thrombosis, and bone marrow failure. Constitutional symptoms (fatigue, lethargy, malaise, and asthenia) dominate the history, but nocturnal hemoglobinuria is a presenting symptom in only about 25 percent of patients. Directed questioning frequently elicits a history of episodic dysphagia and odynophagia, abdominal pain, and male impotence. PNH should be suspected in patients with non-spherocytic, Coombs’-negative intravascular hemolysis. Reticulocytosis reflects the response to hemolysis, although the reticulocyte count may be lower than expected for the degree of anemia because of underlying bone marrow failure. Serum LDH concentration is always abnormally high in patients with clinically significant hemolysis and serves as a valuable surrogate marker for determining and following the rate of intravascular hemolysis. Most patients are iron-deficient because of chronic hemoglobinuria and hemosiderinuria (even in the absence of gross hemoglobinuria). Venous thrombosis, often occurring at unusual sites (Budd-Chiari syndrome; mesenteric, dermal, or cerebral veins), may complicate PNH. Arterial thrombosis is less common. Varying degrees of leukopenia, thrombocytopenia, and relative reticulocytopenia reflect the extent of marrow insufficiency. Bone marrow analysis is warranted to determine cellularity, morphology, and iron stores. Non-random cytogenetic abnormalities are uncommon in PNH, but karyotyping may be informative if myelodysplasia is suspected. 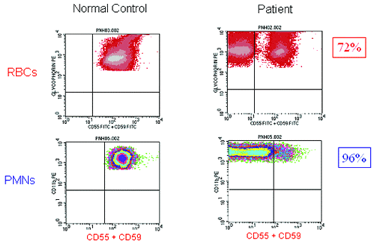 Flow-cytometric analysis of GPI-AP expression on bone marrow cells has no clinical utility. Based on the results of laboratory studies, bone marrow analysis, and flow cytometry, patients can be placed into one of three categories based on the recommendation of the International PNH Interest Group4 (see Table). Eculizumab is expensive (nearly $400,000/year), and it has no effect on the underlying stem cell abnormality, meaning that treatment will likely continue indefinitely. Because the clinical manifestations of PNH vary widely among patients, not all are appropriate candidates for treatment with eculizumab. Prior to recommending eculizumab therapy, PNH clone size (based on flow cytometric analysis of GPI-AP expression on PMNs), rate of hemolysis (based on serum LDH concentration), and degree of bone marrow failure (based on blood counts, reticulocytosis, and bone marrow cellularity and morphology) should be determined. Patients who are likely to benefit most from treatment are those with large clones whose clinical manifestations are primarily a consequence of intravascular hemolysis (Classic PNH, see Table). Patients with relatively small clones whose primary clinical manifestations are a consequence of bone marrow failure (PNH in the setting of bone marrow failure, see Table) are unlikely to benefit from eculizumab. For those patients, treatment should focus on the process that underlies the bone marrow failure. Eculizumab has no role in the management of Subclinical PNH, and, in those cases, treatment should be aimed at the marrow failure process. The use of steroids (glucocorticoids and androgens) in the management of PNH is controversial.4 Corticosteroids can be used to mitigate a hemolytic paroxysm, but long-term use is not recommended because of unacceptable toxicity. In my experience, hemolysis is ameliorated in about one-third of patients with Classic PNH treated with danazol, a generally well-tolerated synthetic androgen that does not cause masculinization. Danazol may have the added benefit of providing benefit for the hypoproliferative component of the disease. Patients should be iron replete before initiating therapy with danazol, and liver function should be monitored regularly. General supportive measures include repletion of iron stores and folate supplementation. Red cell transfusion is safe and may be necessary for treatment of inadequately compensated anemia. Bone marrow failure. Treatment of anemia that is primarily due to bone marrow failure should be aimed at the underlying disease (e.g., aplastic anemia, refractory anemia/MDS). If absolute or relative erythropoietin deficiency is felt to contribute to the anemia, replacement with the recombinant protein is warranted, but patients should be closely monitored as erythropoietin supplementation may exacerbate hemolysis by increasing production of GPI-AP deficient RBCs. Bone marrow transplantation. Prior to the availability of eculizumab, the primary indications for transplant were recurrent, life-threatening thrombosis and uncontrollable hemolysis. The latter process can be eliminated by treatment with eculizumab, and the former process may also respond to inhibition of intravascular hemolysis.10 Nonetheless, transplant is the only curative therapy for PNH, and the availability of matched unrelated donors, less toxic conditioning regimens, reduction in transplant-related morbidity and mortality, and improvements in post-transplant supportive care make this option increasingly attractive. The decision about transplant is complex, however, and requires input from the patient, an experienced hematologist, and a transplant specialist. Pregnancy. There are both maternal and fetal risks when PNH occurs during pregnancy with the risk primarily being due to thromboembolic complications.4 Untoward events can be expected in at least half of the mothers and in some of the neonates. Counseling female patients with PNH about pregnancy should take into account age, overall health, PNH clone size and phenotype, extent of hemolysis, degree of bone marrow failure (especially thrombocytopenia), previous thrombosis, and comorbid conditions. Despite the many concerns, successful outcomes appear to be the rule rather than the exception. But management is complicated and should involve the combined efforts of an experienced hematologist and an obstetrician specializing in high-risk pregnancy. Unless there is an absolute contraindication, anticoagulation with heparin (preferably low-molecular-weight heparin) should be initiated as soon as pregnancy is documented and continued until immediately prior to delivery. Heparin should be reinstituted post-delivery as soon as treatment is safe, and prophylaxis with warfarin is recommended for three months after parturition. Eculizumab is not approved for use in patients who are pregnant. If a patient becomes pregnant while being treated with eculizumab, the drug should be discontinued and prophylactic anticoagulation with heparin should be initiated. Treatment with eculizumab can be restarted in the immediate postpartum period. Whether treatment with eculizumab obviates the need for prophylactic anticoagulation in the postpartum period if the patient has no antecedent history of thromboembolic complications is unknown. Lacking data to the contrary, prophylactic anticoagulation during the postpartum period is recommended for these patients. Eculizumab has changed the natural history and management of PNH. But PNH is not a binary disease, and not every patient who has a PNH clone is an appropriate candidate for treatment. In particular, patients with small clones whose primary clinical manifestations are a consequence of bone marrow failure are unlikely to benefit. Appropriate disease classification (see Table) based on clone size, underlying bone marrow pathology, and rate of hemolysis, along with an understanding of the pathophysiology of the anemia and the heterogeneous nature of the disease, are needed in order to make a rational decision about management. 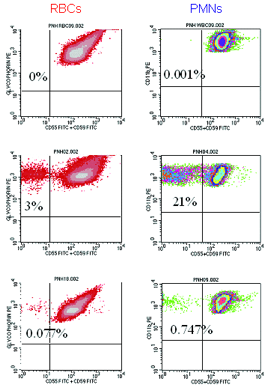 Figure 2: High-resolution flow cytometric analysis of peripheral blood RBCs and PMNs from patients with PNH. Analysis of the peripheral blood of a patient with Classic PNH (upper panel, r.) shows that a high percentage of the peripheral blood RBCs and PMNs are GPI-AP deficient. The percentage of GPI-AP deficient PMNs (96%) is higher than that of the RBCs (72%) because PNH RBCs are selectively destroyed by complement, whereas PNH PMNs have a normal life span. Patients with PNH in the setting of bone marrow failure (e.g., aplastic anemia or refractory anemia/MDS) typically have relatively small PNH clones (lower panel, middle). In these cases, the contribution of hemolysis to anemia is usually modest. Patients with Subclinical PNH (lower panel, r.) have very small PNH clones that require high-resolution techniques for detection. They produce no biochemical or clinical evidence of hemolysis. Parker CJ. The pathophysiology of paroxysmal nocturnal hemoglobinuria. Exp Hematol. 2007;35:523-33. Endo M, Ware RE, Vreeke TM, et al. Molecular basis of the heterogeneity of expression of glycosyl phosphatidylinositol anchored proteins in paroxysmal nocturnal hemoglobinuria. Blood. 1996;87:2546-57. Sugimori C, Chuhjo T, Feng X, et al. Minor population of CD55-CD59-blood cells predicts response to immunosuppressive therapy and prognosis in patients with aplastic anemia. Blood. 2006;107:1308-14. Parker C, Omine M, Richards S, et al. Diagnosis and management of paroxysmal nocturnal hemoglobinuria. Blood. 2005;106:3699-709. Rother RP, Rollins SA, Mojcik CF, et al. Discovery and development of the complement inhibitor eculizumab for the treatment of paroxysmal nocturnal hemoglobinuria. Nat Biotechnol. 2007;25:1256-64. Hillmen P, Young NS, Schubert J, et al. The complement inhibitor eculizumab in paroxysmal nocturnal hemoglobinuria. N Engl J Med. 2006;355:1233-43. Brodsky RA, Young NS, Antonioli E, et al. Multicenter phase 3 study of the complement inhibitor eculizumab for the treatment of patients with paroxysmal nocturnal hemoglobinuria. Blood. 2008;111:1840-47. Hall C, Richards S, Hillmen P. Primary prophylaxis with warfarin prevents thrombosis in paroxysmal nocturnal hemoglobinuria (PNH). Blood. 2003;102:3587-91. Moyo VM, Mukhina GL, Garrett ES, et al. Natural history of paroxysmal nocturnal haemoglobinuria using modern diagnostic assays. Br J Haematol. 2004;126:133-8. Hillmen P, Muus P, Dührsen U, et al. Effect of the complement inhibitor eculizumab on thromboembolism in patients with paroxysmal nocturnal hemoglobinuria. Blood. 2007;110:4123-28.